• Our Royale Mattress was designed for people who don’t want to give up the feeling of a traditional mattress but still want the pressure relief and durability of latex. • The Royale is a 2-Sided flippable mattress because the best innerspring mattresses are made with two sides so that they last longer. One side offers a comfortable firm feeling while the other side offers a softer feeling. 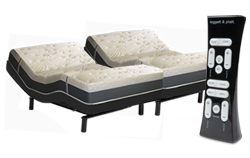 This mattress has become the most popular choice for couples buying split king adjustable beds. • By using 100% Natural Talalay Latex on both sides of our mattress, we don’t have to pad our mattress with thick quilting and other synthetics that often break down causing body impressions and sag. • The Fabric-Encased Coils are made by Leggett & Platt and feature their Quantum Edge technology, which offers dynamic support all of the way to the edge of the bed. When you sleep on the edge of this bed, you won’t get the feeling that you’re rolling off. 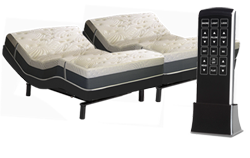 • A lot of people are concerned whether a spring mattress will work on an adjustable base, but Quantum Edge technology was designed by Leggett & Platt specifically for use on their adjustable bases. The Quantam Edge technology is more durable and bends easier than the foam encasements. As a matter of fact, Leggett & Platt has tested their Quantum Edge Technology and it bends 24% easier on their adjustable bases and is 26% more durable than a foam encasement. • Our Multi-Stage Cooling System with a Tencel Mattress Cover and Pin-Core Cushion Holes reduces heat and wicks away moisture to keep you cool and dry while you sleep. There are a number of reasons why our beds are better. Watch this video about our Latex to learn more.